For the last two years, the Lake Norman Chamber of Commerce’s Diversity Council has gathered various members of the community to participate on a Dragon Boat Race team as part of the annual Asian Festival held at Ramsey Creek Park. Although the team dynamics and weather conditions varied, what remained constant was the “fun” that was had by all. 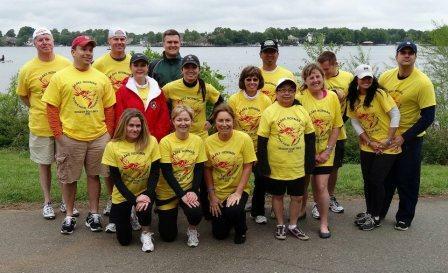 Team members practiced together at Morningstar Marina up to two times to prepare for “Race Day”. It’s always amazing to see how the team bonds together as the competitive juices start flowing. In fact, the Lake Norman Chamber team which has been named “Torcher Chamber” won their first two heats, and while they did not clinch their division title, they were within several seconds from the medal winners in the final Championship race. This is pretty impressive given there were only 16 crew in the boat (a full boat has 20). A big thanks goes to the team captain, Susan Gresham for coordinating this effort and to the team’s steerer, Brian Tarle who has invited everyone to Saturday practices in preparation for next year’s race. As we continue each year to gain experienced dragon boat participants around our community, we look forward to the Diversity Council’s continued support of this event!